Venerable Traga Rinpoche was born in 1954 into a long lineage of great Tantric Yogis. His paternal ancestry traces back to RigDzin Godem (1337-1408), the discoverer of the Northern Treasures of the Nyingmapa School. At age 4, the 7th Lhotual Khakhyab Dorje recognized him as the reincarnation of Togden Tsondru Tharchin, but due to political unrest in Tibet there was no opportunity to enthrone him and teach him Dharma at that time. An accomplished Dzogchen and Mahamudra master, Traga Rinpoche has received profound foundational as well as the most advanced teachings from some of the greatest masters of Tibetan Buddhism, including His Holiness Chetsang Rinpoche, Khenchen Jigme Phuntsog, and Khenpo Munsel. He studied and practiced Vajrayogini, Marpa’s Guru Yoga, and the Six Yogas with a Karma Kagyu Togden known for flying from mountaintop to mountaintop. Traga Rinpoche has completed over 10 years of retreat. From His Eminence Garchen Rinpoche, Traga Rinpoche received teachings on all Drikung Kagyu texts, the five-fold Mahamudra, the entire Dzogchen Yangzab teachings, and many profound pith instructions. 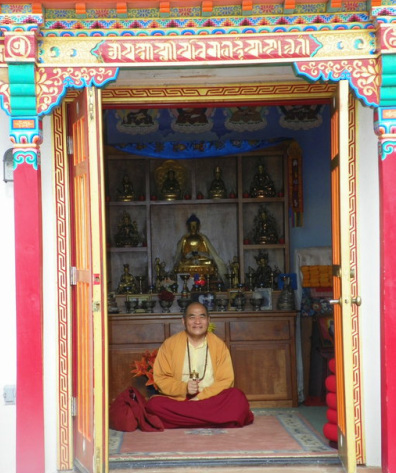 He then did his Dzogchen Yangzab retreat at Lho Miyel Gon monastery. In 1984, Traga Rinpoche received full gelong ordination from the Nyingma master Khenpo Munsel, who gave him the detailed teachings on Dzogchen Cutting Through the Resistance to Primordial Purity. Khenpo Munsel gently looked at Traga Rinpoche and said, "Your karmic propensity is to practice Dzogchen. I am your karmic lama. If you can meditate, you have today found the way to liberation in one life. You will never find something like this even if you went to look for it with your horse's hooves encased in steel. Spend one year near me and meditate." For the next seven years, he did retreat near Khenpo Munsel, and practiced Cutting Through, Passing Over, and many other advanced practices. In 1998, Lamchen Gyalpo Rinpoche -- determined to make Traga Rinpoche's vast knowledge and profound experiential understanding of the highest level of Dzogchen teachings accessible to as many students as possible -- enthroned him as Lopon Rinpoche (Precious Master), with lavish praise for his hard work and outstanding achievements. 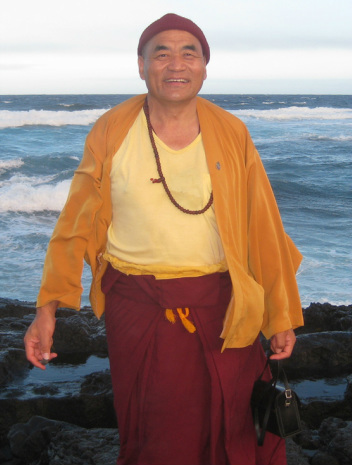 Venerable Traga Rinpoche founded RigDzin Dharma Foundation in Albuquerque, New Mexico, in February 2005. He has also served as retreat master at the Garchen Buddhist Institute in Chino Valley, Arizona. Restoring his Temple in Jisa. The Jisa Water Project - Installing a pipeline to bring running water to two villages and a monastery. Chethak Ruchen - Maintaining a school for local nomadic children and orphans.